Yesterday, we had a heat wave…with a high 47 degrees. The good news is that the muck that fell Saturday began to melt. That, and a cute teenager in braces, a neighbor kid, stopped by and asked if he could shovel the driveway for $20. David finally acquiesced, and I said yes, of course After he uncovered the driveway, sidewalks and cars, we told him he could come back anytime it snowed. Nothing does my heart more good than seeing a kid working for money. We live in a mixed race neighborhood the data firms label “Bohemian’ (although its changing). The kids who live here are good kids, taking odd jobs, earning good grades in schools, going on to college. We’ve seen this pattern repeated over and over with various sets of kids. Often the parents move away after the kids are grown and leave home, or one of the parents eventually dies and the widow (it’s always a widow) moves, leaving her house behind. Then a new young couple moves in, gets married, has a baby, and the whole process repeats. Demographers call this process succession. Once upon a time, my children were the neighborhood kids, then they grew up, moved away and my grandchildren were the neighborhood kids. Now they are grown and moved away too. When I complain about winter, it isn’t the cold that bothers me, it’s the foul weather. We’ve had abnormally foul weather this year, breaking all kinds of records. But don’t get me wrong, I love the cold. I sleep better when its cold, and I keep the heat turned off in my bedroom so its icy cold at night. During the day, when its cold, I layer, adding clothes. I’ve always looked better in tailored outfits, and love layering sweaters and jackets to wear with slacks. I hate heat. I’ve hated heat ever since I was a kid and had chicken pox one summer when I lived in NC. Chicken Pox are bad enough but in the heat of summer without AC this is a miserable disease. And we lived in western NC where it was cooler compared to other parts of the South. Bathing in baking soda water helped for a short while, but those pox are with you for days and days and you can’t live in a bathtub. One reason I was ecstatic about moving back to the DC area in 1966 after living in Tampa FL for three years, was because I hated the heat. Three years of living in humid heat and pregnant during one of them…Yuck. Most people who visit Florida and points South, do so in the winter months, often February. But I grew up in the South, and hated it. After a year back in Virginia, we moved to Hawaii where we lived for several years. Hawaii was not as bad as FL. The trade winds kept the air clean and we had vents in our walls that opened to let the air come in along with the vermin of one kind or another. This was base housing on Pearl Harbor so it had no air conditioning, but I didn’t mind. The heat in Hawaii was nothing compared to the heat in FL. When my then husband shipped out to Japan, I elected to move back to Arlington VA…my home. Later, he begged me to move to Japan, but I said no, so he accepted a reassignment to the Pentagon and moved back to DC which he hated. Hawaii had seasons, but, I missed the fall and winter months back home. I like cold and I love the East Coast. 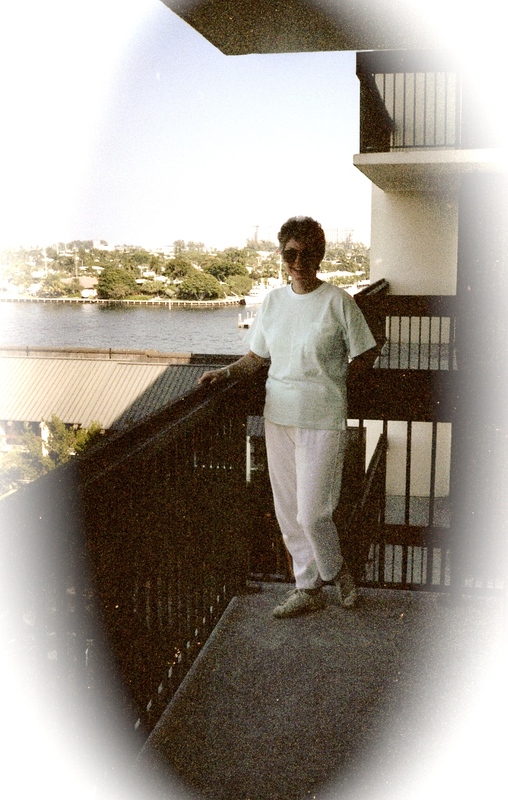 Afterward, we had a pretty good time (David hates to travel), driving down to the Keys where my son was stationed with the US Navy, then over to the Everglades afterward. But it was February and the climate was serene. This winter, we’re keeping the house warmer (68 degrees) because David who always loved the cold says he feels it badly these days. Perhaps when you are really old and thin the heat of FL summers feels good? David was born in Lakeland FL, but when I ask him if he wants to move back, he says NO! He’s done traveling! This entry was posted in Contemplation, Elder Blogger, Environment and Nature, Family/Children, Fashion, Friends and Neighbors, Memories, Travel by SchmidleysScribblins. Bookmark the permalink. I might have felt different if we’d lived where it was cold and dry. But the rainy damp cold in Oregon really got to me. That and the gray. My bones ached all the time. It’s beautiful in the summer tho ., so the bicoastal life works for us and we’re not quite ready to quit traveling. We know we’ll have a big decision down the road at some time in the not to distant future tho of course. We keep our options open and hope we know when it’s time to make it! I hope your knee gets better (from the post above). You would be surprised to see how much the base housing has improved. It’s gorgeous and they all seem to have solar panels. As for the seasons, I know what you mean. I miss them too… except for January and February. I’ve never been to Florida. It will have to stay on our bucket list for now. My son Richard is the director of the organization that oversees infrastructure at several Naval bases in the West. I don’t know if that includes Pearl. My body does not tolerate extremes of heat or cold. The damp cold of Ireland seems to seep right through to the bones. Extreme cold is not good for my heart, even drinking very cold water can sent me into spasm. My metal hip feels like a frozen girder day and night, but hell, at least with it, I HAVE NO PAIN! I’d love it if I were pain free. The cold here has been dry, everything frozen. It was miserably hot Summers in Virginia when I lived there. The bugs. The bug bites. The humidity. I never thought of Virginia as hot and humid, but it is. Winters. I never thought of VA as snowy, but it is. Then again, I tenaciously hold on to my place out here in the sun. You must have been stationed in the area around Yorktown. Yes, ewe have some humidity here, but last summer was very nearly perfect. Also, unlike SD we have ample rainfall. We pay a price for the rainfall…humidity. I may be a victim of the moment but right now scorching heat sounds great! Melbourne has seasons ( 4 in one day sometimes 🙂 ) – this current summer has been more humid than the previous 4/5 but that certainly doesn’t mean I want the cooler weather to arrive. When it does I’m off up north to warmer climes! Lucky you. Your husband still likes to travel. Yes I’m lucky in that respect Dianne but remember my David is a little bit younger than yours. For some of us, our attitudes and desires change as we get older. Like you, I HATE heat! Louisiana is hot and humid 6 months of the year, but the scorching heat of Dallas trumps that. Dallas was hellish and I’m so glad we were able to move from there, though I do miss my boys who still live there. You have had such an interesting life and I so enjoy reading about it on your blog. Thanks Gail. Yes, LA is hot. My sister lives in BR and I found her climate awful. Dallas is worse. We were born in TX and ran around half naked much of the year. Gimme heat over cold any day. ‘Course I’ve never lived in Florida, so I don’t really know what I’m talking about. Actually, I think you’ve got about the best climate — short winters, long springs and falls. Anyway, do you have that kid’s phone number? Does he make house calls to New York? Hundreds if not thousands of retirees move to VA every year, most from New York and New England, and some from FL. They call the retirees from FL ‘halfbacks’ because most of them moved to FL from New York and found it was not the place for them. So, they migrate again to VA, NC and SC. An outer ring of retirement communities has grown across VA from Fredericksburg to Gainesville and Warrenton, and further south from the Norfolk area to Richmond, Charlottesville and Roanoke. Geriatric medicine and Veteran care are very important in our Commonwealth. VA also is home to many retired military personnel and their families. VA now has two moderately conservative Democrat Senators plus a Democrat governor. Although seniors tend to be more conservative, they are also concerned with social issues. I like a normal heat but compared to the humidity of summers here, I much prefer the cold weather and turn the temperature way down at night. I remember my first humid summer after moving here in 1975. I couldn’t believe how uncomfortable I was and practically lived on the floor underneath the air-conditioning box in our apartment. If you are not used to the humidity it can be brutal. August is the worst. I don’t only dislike heat I also dislike being in the sun. The older I get the more this is true. I now come out in little blisters in the sun, a kind of sun rash. I always choose the shady side of any street and always work in the shady parts of the garden. I like temperate weather, max 25 degrees C and min 5 degrees C. The UK is actually very suitable for me in that respect, although the permanently grey skies can be depressing. Still you have those beautiful days too. Perhaps we need the grey to truly love the blue. I found this to be a sweet post, regardless of your dislike of the heat. I don’t care for extreme weather conditions, hot or cold. Anyway, that’s a very nice photo of you. Thanks Gigi. I think CA where my son lives is very nearly perfect, except the taxes, water shortages and high cost of living are off-putting.